Happy Thanksgiving, blog friends! I hope that you are having a lovely day whether you celebrate Thanksgiving today or not. 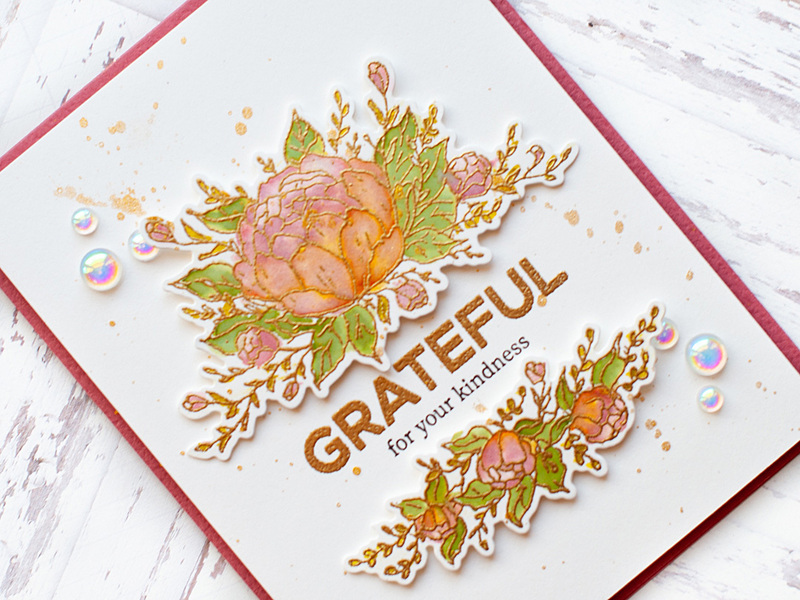 I wanted to drop by and just tell you that I am super grateful for YOU, your comments and the support you give me here in my little crafty world. I truly appreciate it! 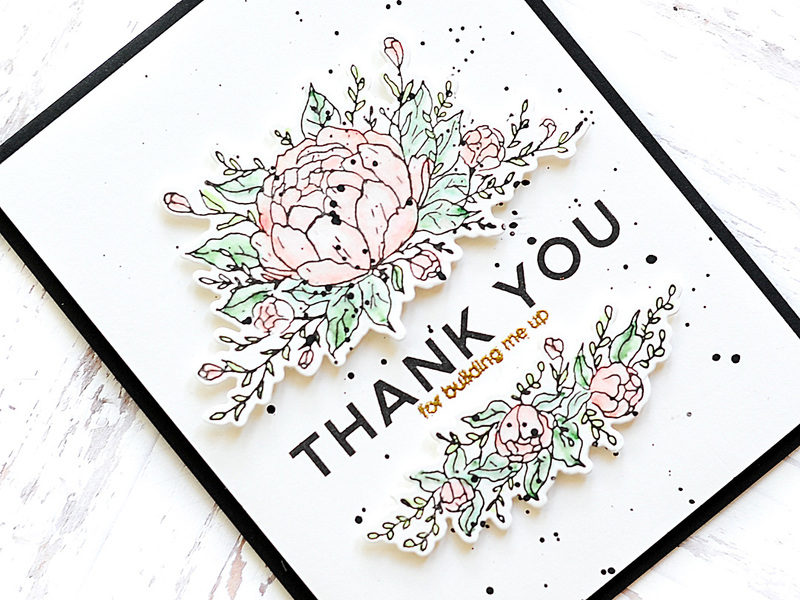 I'm taking a quick break from my day to pop in and share this Thanksgiving themed Thank You card with you featuring the lovely Bloom stamp set from Pinkfresh Studio. 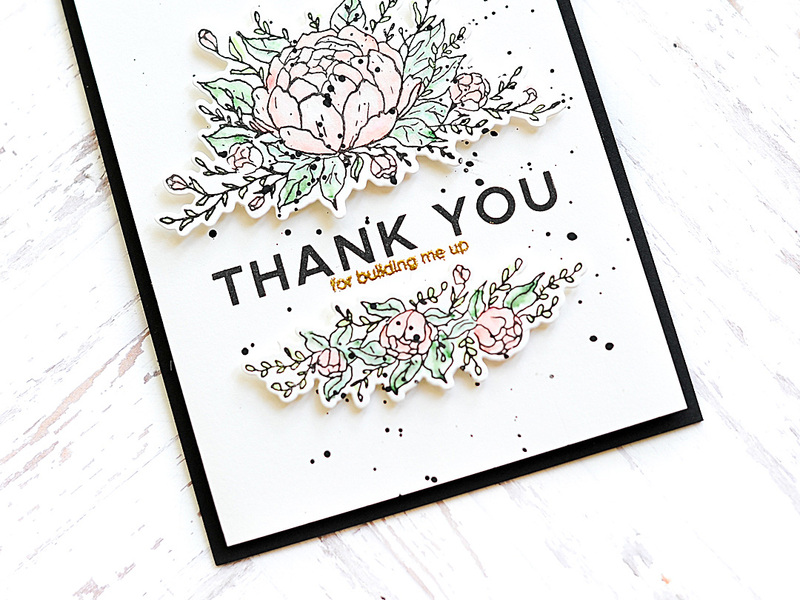 I adore this stamp set, with it's clean & graphic sentiments and daintily drawn florals...it's just plain lovely. 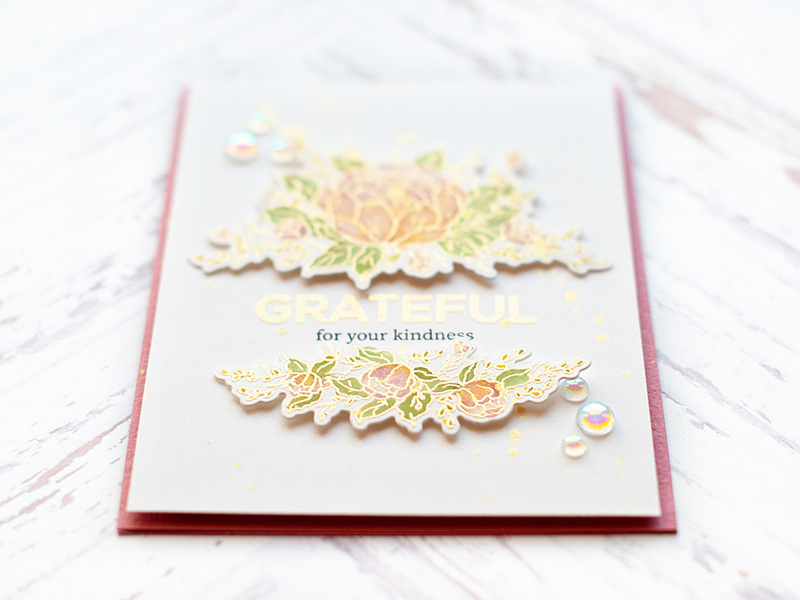 To start this card, I stamped & heat embossed the florals to heavyweight white cardstock in Gilded embossing powder. I watercolored them using Distress Inks in the following colors: wild honey, victorian velvet, spun sugar, peeled paint & crushed olive. Then I set the entire panel aside to let the watercolor dry. Next I stamped & heat embossed the sentiment to the middle of a heavyweight white cardstock panel cut slightly smaller than A2 size, using the coordinating dies as a guide for the placement. 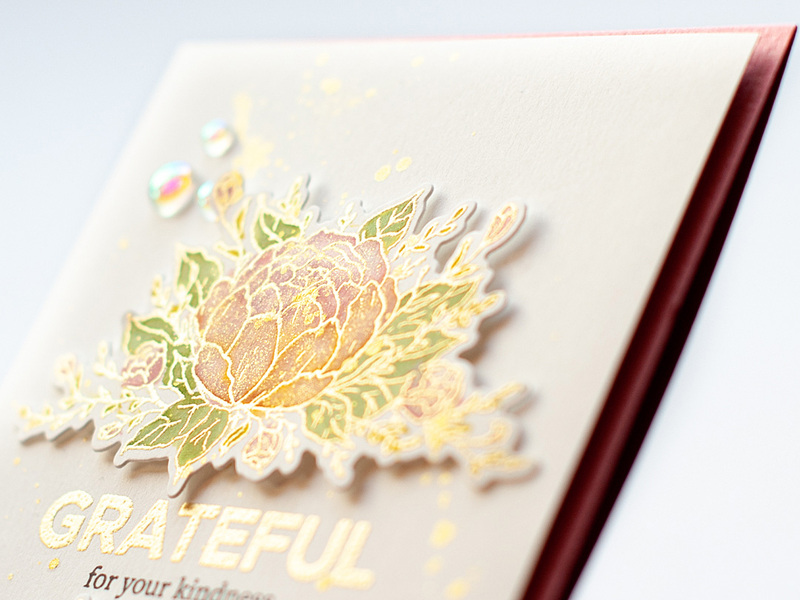 I embossed the word GRATEFUL in matching Gilded embossing powder, and the second part of the sentiment is stamped in onyx black Versafine. 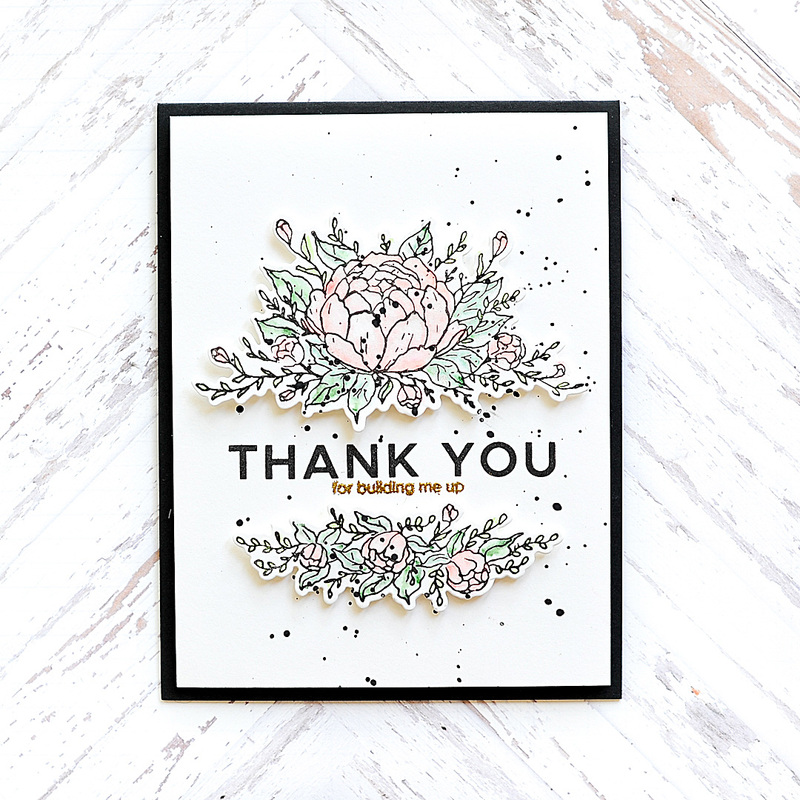 By then the watercolor was dry, so I cut the blooms out with their coordinating dies, then layered them to the top and the bottom of the sentiment using foam tape. Then I mounted the entire cardstock panel to the front of a dark pink A2 cardbase. This is an older sheet of Bazzill cardstock that I've had in my stash for awhile, so I don't know the exact shade. But you can substitute it for anything you might already have! 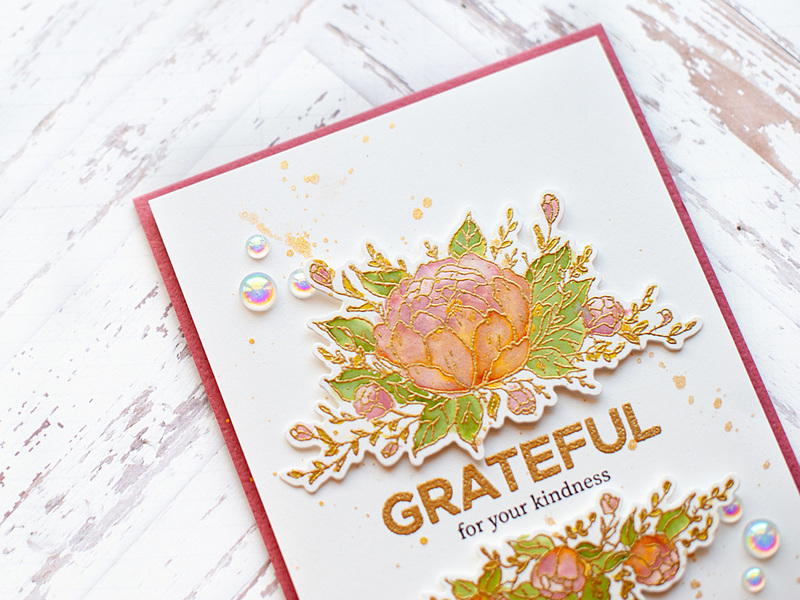 Finally, I accented here & there with some Studio Katia Iridescent Bubbles (these are SO fun, BTW. I have a feeling I will use these more in the near future!). 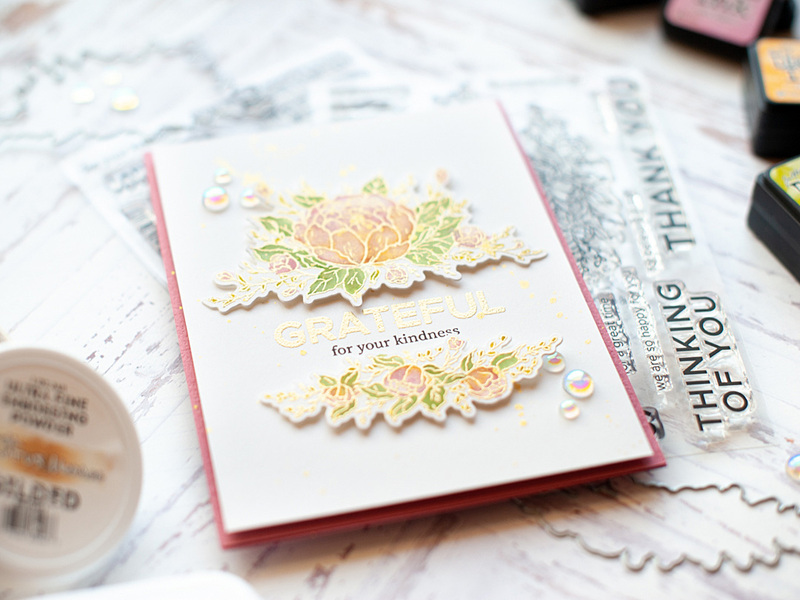 And lastly, I added some glitter to the blooms using my Midas Touch Tonic Aqua Shimmer pen. Here is an "extra" card for you! The only differences are that I did not heat emboss the blooms, and I colored them in with Zig Clean Color Real Brush Markers. I also used black paint splatter in place of gold. Other than that - the steps are exactly the same! I hope that you have a wonderful rest of your Thursday & Thanksgiving! I hope you had a wonderful Thanksgiving with your family. Your cards are just stunning! !